Randy Kohr had eight very small and odd-looking assistants to help him teach a class of first-graders Friday at the Ocean City Primary School. The squat robots at Kohr’s feet resembled four oversized billiards balls that had been patched together to create a bizarre prop for a sci-fi movie. They whirled around on the floor, flashed different colored lights and made funny sounds. Whimsically named after Santa’s reindeers, the robots may seem goofy at first glance, but they are actually an innovative teaching tool to introduce primary school students to emerging technologies that will be shaping the world by the time these same children enter the workforce as adults. Kohr, the primary school’s technology teacher, said the robots are helping students to learn the basics of computer programming, engineering and mathematics as they prepare to advance to higher grades and tackle high-tech courses. “They’re going to be light years ahead of other students who don’t have exposure to these types of programs,” he said. On Friday afternoon, about 25 first-grade students marched into the school’s technology lab supervised by Kohr to learn the fundamentals of computer coding. Computer terminology such as algorithms, de-bugging and programming were thrown around like it was second nature to the kids. “What are algorithms?” Kohr asked the class. “A set of rules,” the children replied in unison. 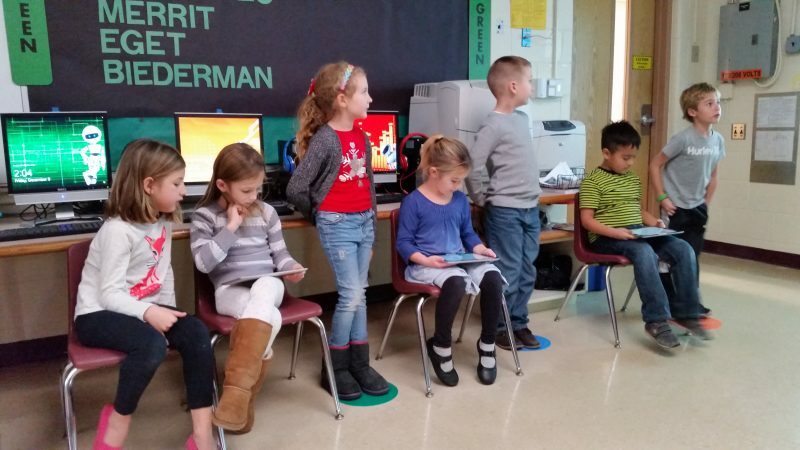 Teacher Carrie Merritt helps her first-grade students learn robot coding using an iPad. 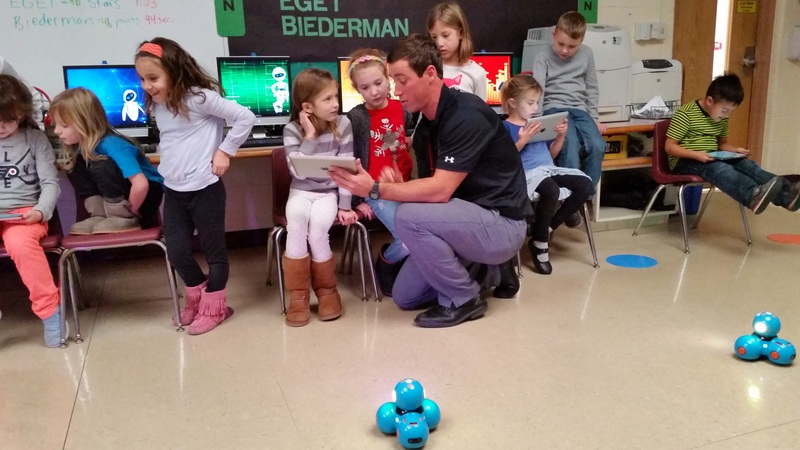 The students separated into groups to learn how to “train” the eight tiny robots, using an iPad to control their movements, sounds and lights. At one point, the children squealed in laughter when they had the robots make neighing sounds like a horse. Scarlett Garrett, another 6-year-old, also enjoyed programming the robots. “My favorite thing was making him dance and neigh like a horse,” she said. Students attend classes every week in the primary school’s technology lab. 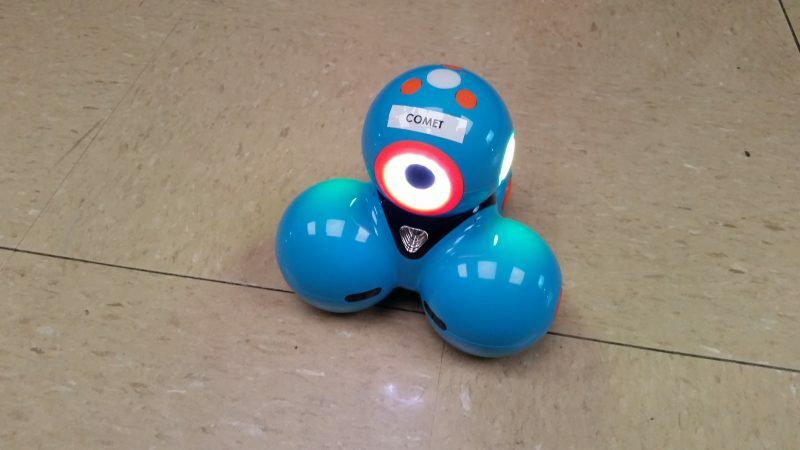 While playing with robots is entertaining for the kids, the programming class also helps to stimulate the students in other subjects, including their writing course, said Carrie Merritt, their first-grade teacher. Kohr, a self-described “technology geek” who is in his first year of teaching in Ocean City, said all of the primary school’s students, from kindergarten to third grade, come to the technology lab each week for classes. It is part of the STEM curriculum – science, technology, engineering and math. “I think it’s our goal to get them as early as possible,” Kohr said of introducing very young students to the STEM courses. The lab is stocked with computers, tiny robots, a 3D printer and an “interactive floor” that serves as another high-tech teaching tool. 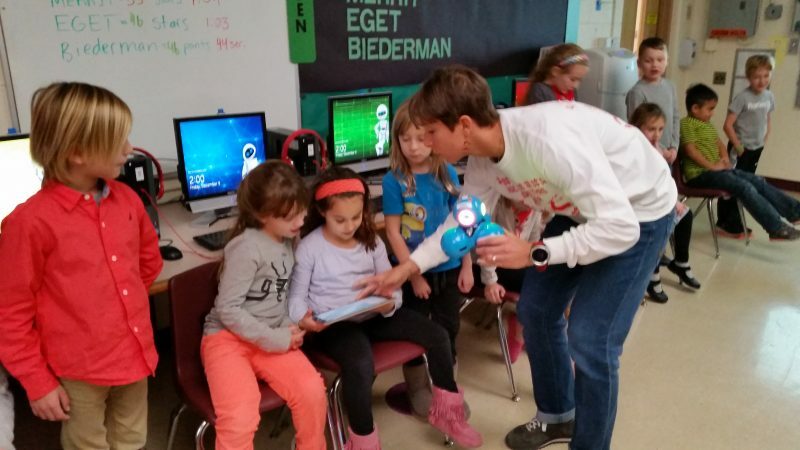 The eight robots used Friday by the first-graders were donated by the Ocean City Parent-Teacher Association, said Cathleen Smith, the primary school principal. Students in the second and third grades are using the technology lab to design rockets as part of NASA’s “Journey to Mars” mission. They have made miniature rockets on the 3D printer and will test their designs during a launch competition in the spring using a compressed-air system. The students will also talk to a NASA engineer during a live video conference scheduled in January, Kohr said. One of eight tiny robots that help introduce students to emerging technologies.